Topiaries in pots set in the front beds accentuate the vertical lines in my English Tudor home and its lamppost. 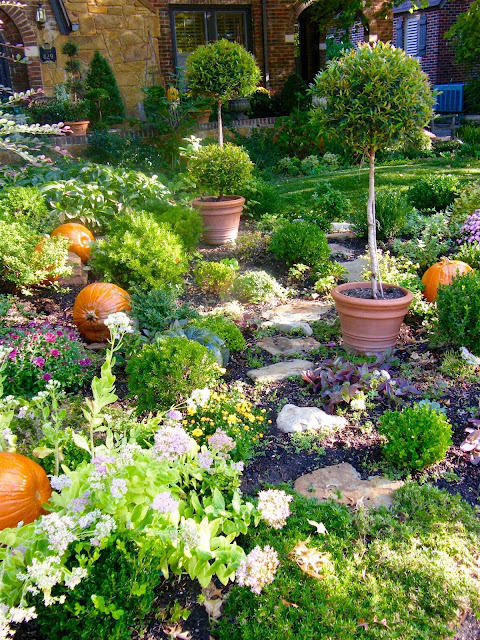 Do you like potted topiaries 'floating' in garden beds or do you find them distracting? 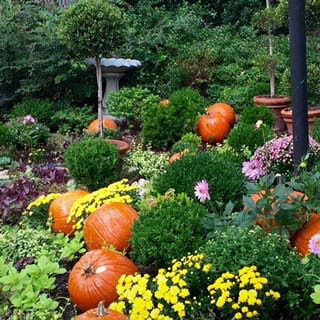 There is no right or wrong answer, but it is an interesting, subjective question in garden design to ponder. 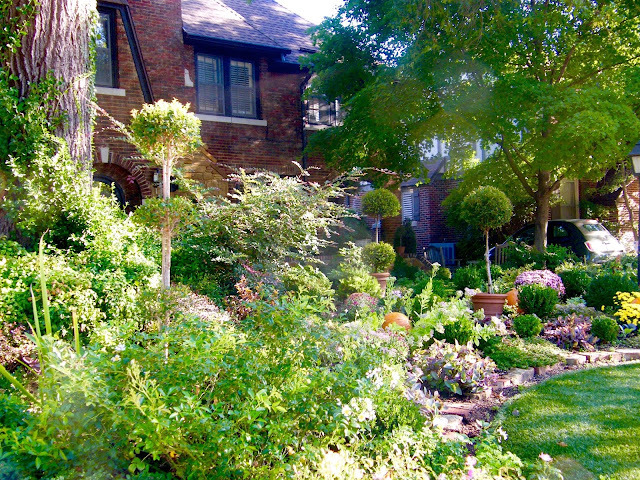 I can see either side of the issue, so, while I obviously fall into the category of LIKE vs distracting, I do try to adhere to certain guidelines in using topiary in the landscape to keep such dissonance and visual interruptions to a minimum. 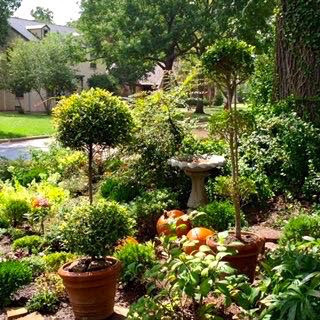 Here are some points to consider if you too enjoy their sophistication and appeal in the garden border. (For a p o t a g e r post on other plant materials to use for topiary, go here). Generally, I like things in threes, though often a third non-topiary element (like the extreme verticality of my oak) can serve as the last element in the triangle. 1. I wanted them to match the scale of my landscape and home. 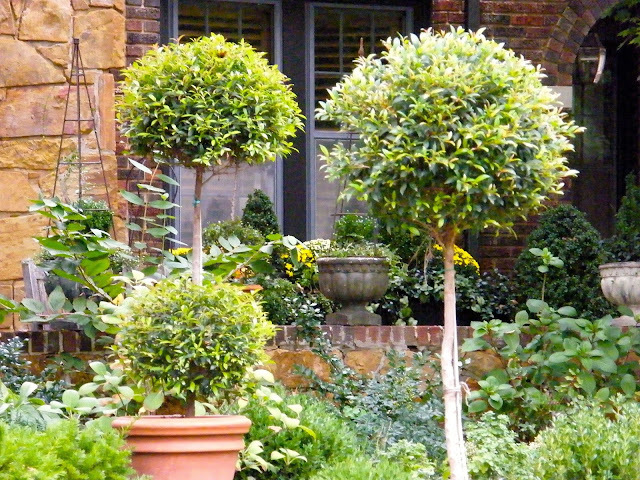 These Eugenia topiaries are three years old and fairly large, about 4-5 feet tall and about 15" across. 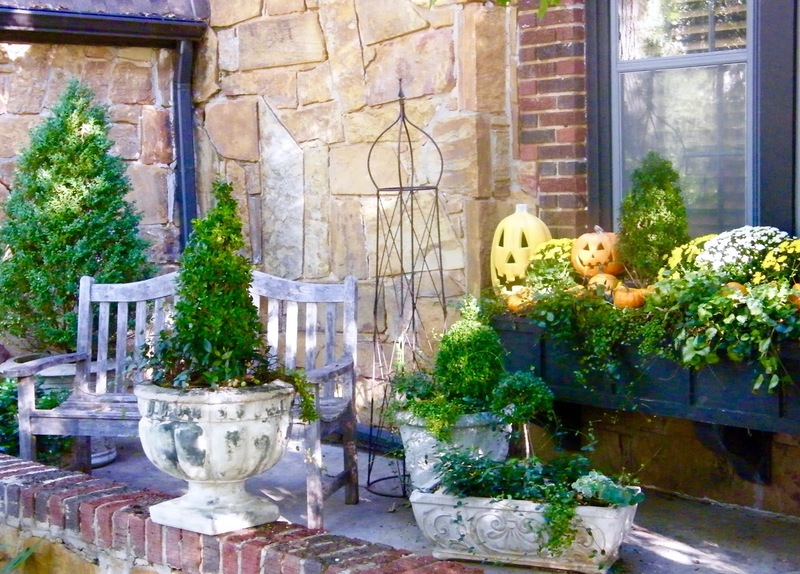 They are in large, real terra-cotta pots, as light weight terra-cotta alternatives don't, in this relatively unprotected area, remain upright in our strong Oklahoma winds. Even THESE heavy pots succumb on occasion (like today and yesterday and the day before that... AARRGH!!) when our proverbial winds are REALLY 'whipping down the plain'. I use a mix of both terra cotta and aged concrete in the beds and on the porch. 2. I went with traditional pots to match the traditional style of my home. 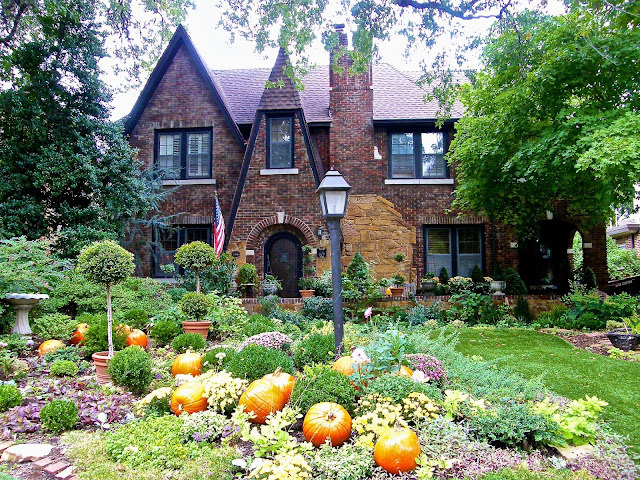 Anything aged, traditional in appearance, and in terra-cotta or concrete would have worked. While I want them to have heft for sturdiness, I don't want them to be SO prohibitively heavy that I cannot move them myself, or have issues with weight when they overwinter in the greenhouse each winter. Because of this, I went with terra cotta, slightly lighter in weight, but meeting my other criteria. Eugenia in one, two and three tier forms, are distinctive and yet harmonious. 3. I used just one type of plant for each of the three pots. Keeping topiary straight and upright can be a challenge, but very handsome and satisfying when they cooperate! 4. It is difficult, but worth the effort I think, to keep them as straight and vertical as possible. Now I need to work on that wayward, and very heavy birdbath. but please don't judge me if they appear tipsy! 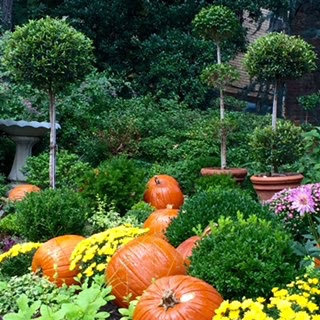 The balls/verticality of the topiary both contrast and echo the rounded forms of the pumpkins and cushion mums. Please do drive by if possible and tell me what you think! 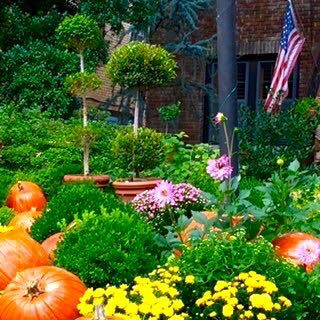 The glossy foliage looks beautiful when it catches the golden light of fall.